Registration is now open for Midget, Female Midget and Bantam Evaluations. Please click on link below to register. Congratulations to all those DHA student athletes who worked diligently and conscientiously in striking a balance between the demanding role of hockey and their academic pursuits. DHA is proud to report that 32 players attained Principal’s List status while 117 players attained Honour Roll accolades for Term 1. The Principal’s List requires students to attain a 92% average or higher and an 83% average for Honour Roll in their best 6 of 8 courses. Wild Pride! Well done Wild! Delta Hockey Academy is extremely proud of teacher Jackie Friesen, who has introduced her English project, Operation Canadian Soldier to our program. Midget Prep player Nic Ardanaz and Friesen reflect on the respect and admiration they have for those that have and for those that continue to fight for our country. DHA is extremely proud to announce that several of its members were successful nominees and have been awarded with CSSHL accolades. Congratulations to the many players who came out on top in all categories. Outstanding work boys! Congrats! Wild Pride! Congratulations to the Midget Varsity Team on their clean sweep over Shawnigan Lake on the weekend. The team downed Shawnigan 5-1 on Saturday and blanked them 5 – 0 again on Sunday afternoon. Paris O’Brien pushed away 19 of 20 shots that came his way on Saturday and all 17 shots on Sunday. Riley Wallack came up big with 3 goals on Saturday for the win while Nick Wagner and Jaden Apan had 2 goals and an assist and 2 goals respectively. Jude Wessel added 5 helpers over the weekend play. Congratulations on a huge team effort! Wild Pride! Congratulations to all those DHA student athletes who worked diligently and conscientiously in striking a balance between the demanding role of hockey and academic pursuits. DHA is proud to report that 24 players attained Principals List status while 90 players attained Honour Roll accolades for Term 1. The Principal’s List requires students to attain a 92% average or higher and an 83% average for Honour Roll in their best 6 of 8 courses. Congratulations to the Midget Varsity team as they edged Okanagan 2-1 on Saturday with the OT winner netted by Jude Wessel. Jadan Apan opened the scoring with the first goal of the game being scored half way through the second. Paris O’Brien stood on his head saving 48 of 49 shots for the win. Way to go Wild! 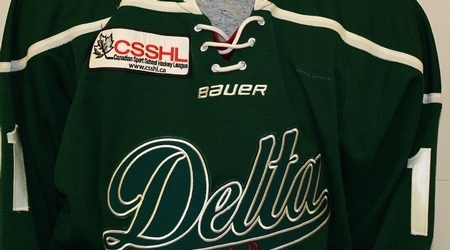 Nicholas Wagner scored twice, including the game winner, as DHA picked up their first win of the season, defeating the Okanagan Hockey Academy by a 3-1 score on Sunday afternoon.